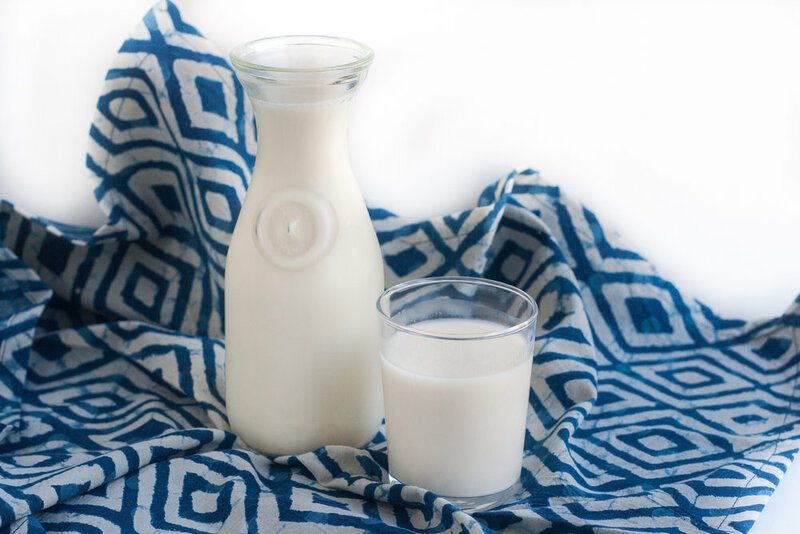 Oat milk is a more sustainable and affordable alternative to almond milk that's been popping up at a lot of coffee shops lately. Oats require less water to grow than almonds and are a Midwestern crop, which means I can source them locally if I like. You can use either steel cut oats or rolled oats to make oat milk--I chose steel cut oats here because you are less likely to overprocess them in the blender (and make a slimy milk) and the remaining oat pulp is easy to fold into any kind of oatmeal for the next few days. The oat milk and pulp will taste best if consumed within 3 days--store both in the fridge. Soaking the oats for at least 30 minutes but up to overnight also helps make sure the final product is not slimy. 2. Strain mixture through the fine mesh strainer into a bowl and remove and store oat pulp. Pass oat milk through the nut milk bag into a quart mason jar (or whatever you'd like to store in it) to get the finer pieces of pulp out. Store in the fridge for 3 days. 1. Mix in a glass and top with ice. 1. Mix in a glass at top with ice. Tear or muddle the mint to get more of the flavor infused. After getting a particularly rough massage to loosen up trigger points in my legs and feet, my massage therapist suggested that I have beets or beet juice to help my muscles recover. Beets are being used in a lot of sports performance beverages because of their supposed ability to improve muscle power by improving blood flow to muscles. The research is mixed on their effectiveness for this specifically, but I figured having a boost of folate, potassium, and antioxidants from beets could do me no harm. Typically beets are juiced with something sweet like carrots or apples, but here I used cucumber to make the whole beverage less sweet and to add some post-massage hydration. Gritty protein powders gross out my tongue and I only recommend them to clients that have very specific dietary or protein needs. Most people do not need processed powders in their diets! However, if you eat mostly plant-based foods and have the need for an on-the-go beverage rich in protein and other nutrients, I think you'll love this whole foods-based protein shake. I combine a full serving of hemps seeds with almond butter to get a shake with 18 grams of protein. The hemp and almond butter also provide good fats in the form of monounsaturated fatty acids and Omega 3s. The fats and fiber from the dates and banana will help keep you fuller longer and help keep your blood sugar from spiking. 1. In a high-powered blender, combine all ingredients and blend until very smooth (It may take a few minutes for the hemp seeds and dates to get totally smooth, but they will.) Serve immediately or store in a jar with a lid in the fridge for up to 24 hours. Here's a basic green juice recipe to get you started with summer juicing. Green apples provide a good balance of sweetness and tartness to help balance the earthy taste of the vegetables. Leafy greens don't generate too much juice, so cucumber and celery help provide more green goodness. Makes one big serving or two small glasses. 1. Put apples, celery, cucumber and spinach in the juicer. Add lemon juice after and serve immediately. Hibiscus flowers can be used to make a tart, floral almost cranberry-like infusion called Jamaica or Agua de Jamaica. High in iron and Vitamin C, you can often find this beverage at your local taqueria. It is also used medicinally in the Middle East and South and Central America and the Caribbean--as with any herbal tea, pregnant women or anyone with allergies or illnesses should consult their doctor before consuming. 1. In a quart-size mason jar, add all ingredients and fill to the brim. Put on the lid and shake. Store in the fridge for 4-24 hours. Strain and serve unsweetened with orange slices and ice in a tall glass. *Note: You can add a little simple syrup or honey if you like it sweet. Can also combined with lemonade, iced tea, club soda or cocktail ingredients. Have fun!